Our second day in Kyoto took us to the northern part of the city. We started our day early with an easy train ride from Kyoto Station to the Arashiyama area in northwest Kyoto. A local curmudgeon greeted the tourists, standing on her porch and muttering with disdain at those who passed by, providing an early opportunity to find a moment of Zen. 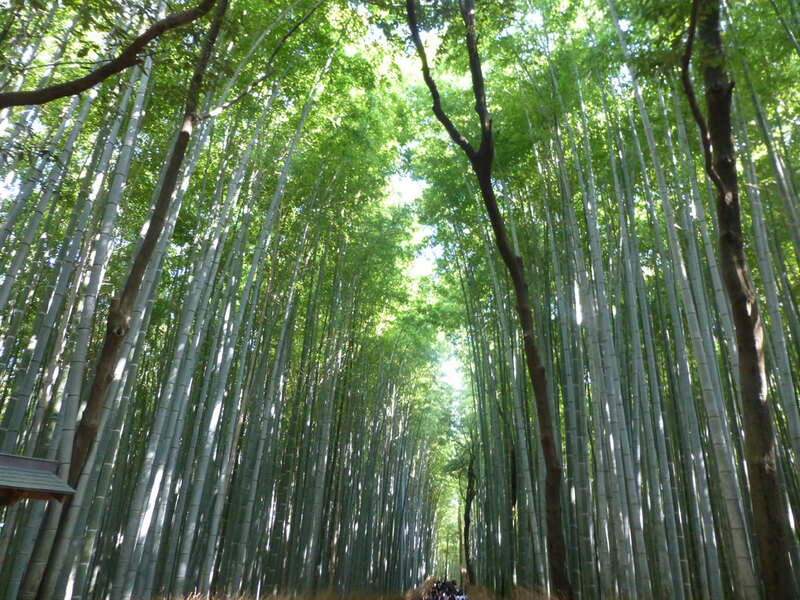 While most visitors headed directly for Tenryū-ji (天龍寺), one of the 17 UNESCO World Heritage sites in Kyoto, we walked the path backward and started in the bamboo forest. Lofty stalks of bamboo bunched on either side of the path enclosed us in tranquility. The bright reds and oranges of the changing Japanese maple tree leaves broke through the glowing green of the bamboo. We circled around and into the back entrance of Tenryū-ji, the head temple of the Tenryū branch of Rinzai Zen Buddhism. The low rolling hills of Mt. Arashi frame the temple grounds. A large garden designed around Sōgen Pond is designated as one of Japan’s “Special Places of Scenic Beauty.” We sat for several minutes and just took in the peacefulness of the scene. 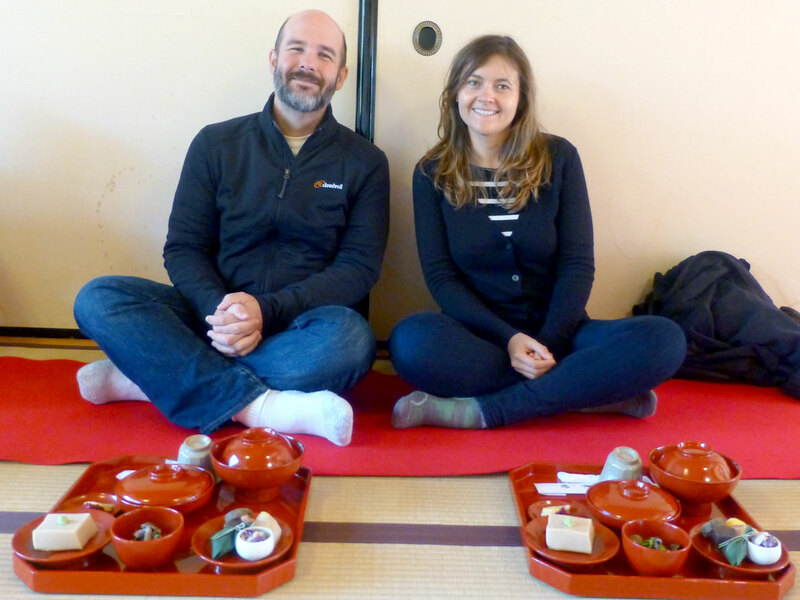 It was already lunchtime and we wanted to make sure to try authentic shōjin ryōri before leaving Kyoto. 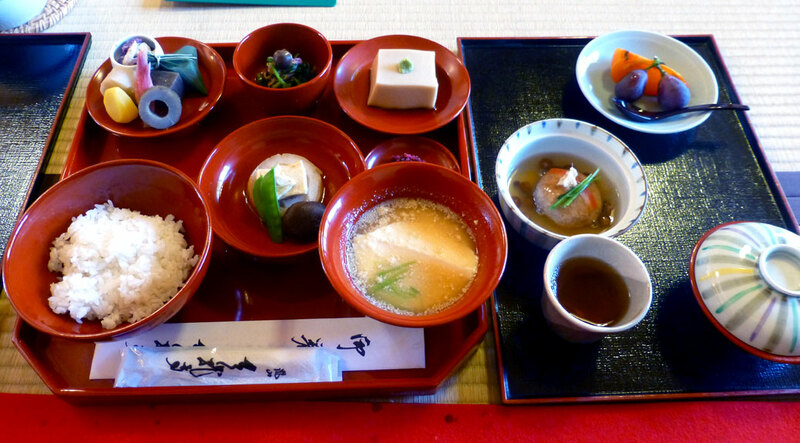 Shōjin ryōri is traditional Buddhist vegetarian cuisine—and the leading cause of the myth that Japan is a vegetarian-friendly country. It’s typically found in or near temples and, due to the ornate construction of the meals, is fairly expensive. Shigetsu is the shōjin ryōri restaurant at Tenryū-ji. We were led into a long room with tatami floors. People sat on the floor along the sides of the rooms. The meal itself is a sensory experience; disparate textures and temperatures create harmony with the sour and savory flavors. Plus, the food was delicious. After lunch, we made our way back into the neighborhood around the temple. 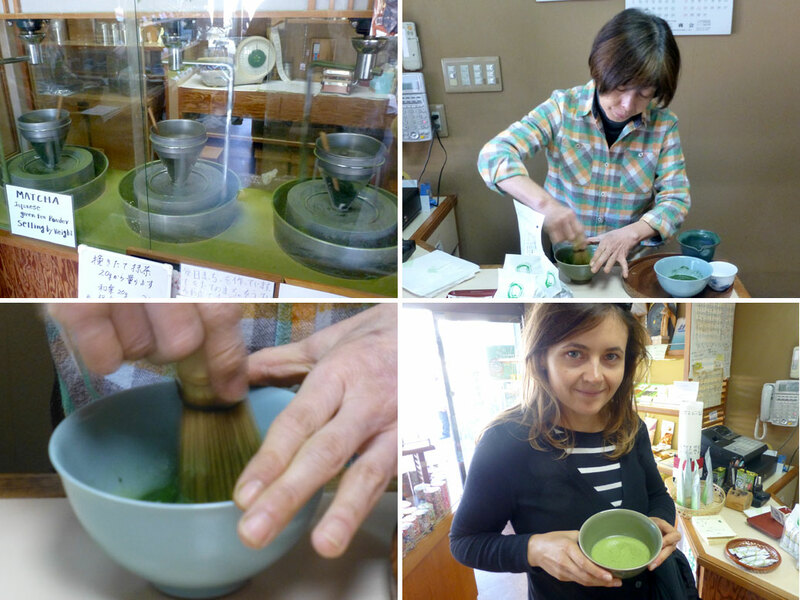 A tea shop was grinding its own matcha. Matcha is green tea that has been ground into a fine powder and is used in traditional Japanese tea ceremonies. She prepared a couple of sample cups. 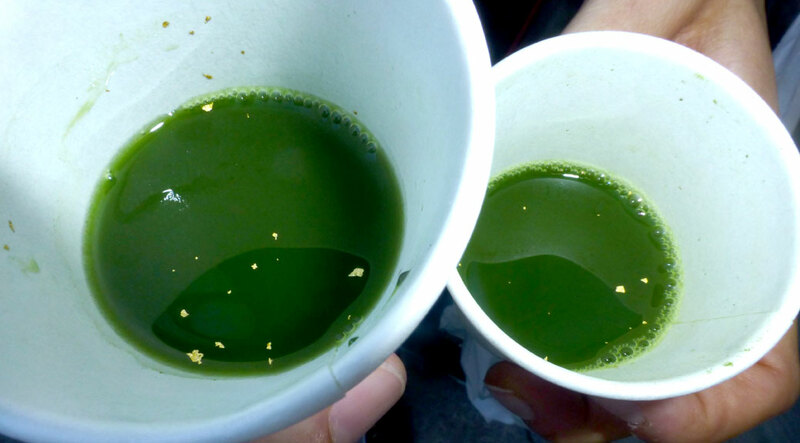 The result was a creamy green drink despite being made only with ground tea and water. We bought a small canister which I swear I’ll prepare this weekend. I swear it! We headed back to the train station (the curmudgeon still cursing at the tourists) and set out for Kinkaku-ji (金閣寺), a Zen Buddhist temple and another of the UNESCO properties of Kyoto. 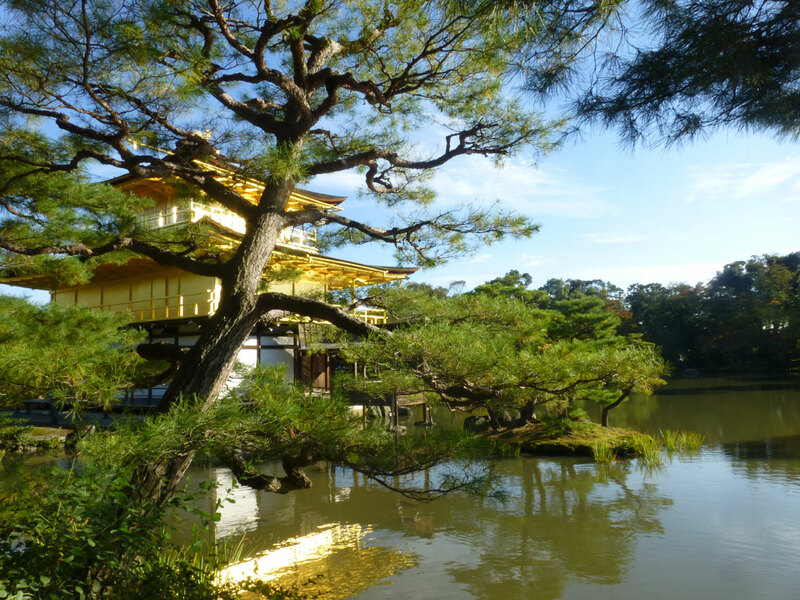 It was a perfect sunny day and the gold leaf of the temple shined brightly. We’d later find out that we were there on Culture Day, so the crowds were especially thick for a Monday. This was the first time the irony of the juxtaposition of tourism in a Zen temple really struck me. The crowd was funneled into an area across the pond to snap the perfect photo, wedging past one another to get an unobstructed shot. Kids ran and screamed like they were at Disneyland, not a 600-year-old cultural icon. We finished our day with a walk to Ryōan-ji, a Zen temple located west of Kinkaku-ji. The grounds have several beautiful gardens and fewer visitors created the most Zen-like feeling of the day. 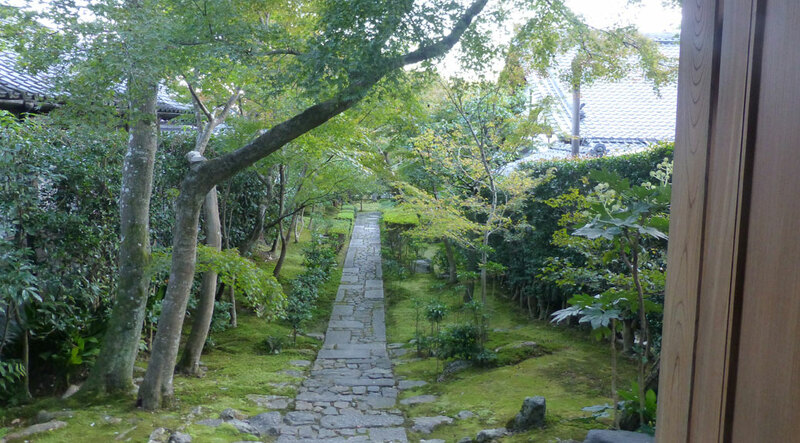 However, Ryōan-ji is best known for its karesansui rock garden. It’s considered one of the finest examples of a dry landscape garden in the world. The sand is raked daily with painstaking precision by the temple’s monks. Seated on the veranda of the residence, you can only see 14 of the 15 rocks in the garden. It’s said that you will only be able to see all 15 stones through attaining enlightenment. Philosophers have long seeked the spiritual meaning of the garden while scientists are fascinated by the symmetry of the garden’s structure and its alignment with the main temple. We’d have just another half-day in Kyoto before heading home. Stay tuned!